The official opening of the Justice and Emergency Services Precinct in Ōtautahi was a proud moment for our iwi as the doors opened to reveal a contemporary building embedded with Ngāi Tūāhuriri and Ngāi Tahu values, narratives and culturally significant artworks. 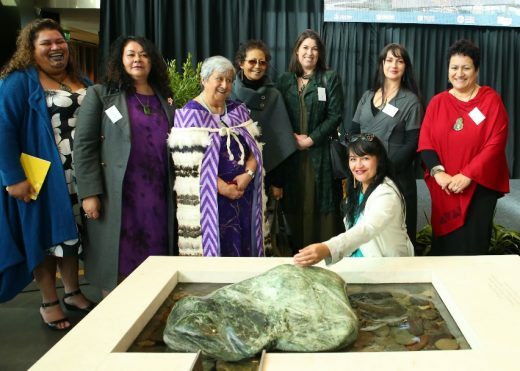 Ngāi Tūāhuriri and Matapopore representatives photographed next to the mauri stone. Te Omeka is a special place – as an anchor project it is a significant investment in the Christchurch rebuild, and for Ngāi Tūāhuriri it represents a visual embodiment of its partnership and contribution as an important rebuild participant. Te Omeka was officially opened by Prime Minister Bill English on 12 September. Ngāi Tūāhuriri whānau gathered to welcome guests and witness this significant milestone for the hapū, and see for themselves how mana whenua history and values were visually expressed in this $300m anchor project in central Christchurch. The name Te Omeka gifted to the Ministry of Justice for the precinct comes from the biblical terms Alpha and Omega, which were used by Tahu Potiki Ratana when he visited the South Island and Tuahiwi. “Te Omeka is a legacy left by the people of Ngāi Tūāhuriri. It asks that our hearts and minds and different faiths be bound as one to the law of Crown and Queen so that the Treaty may speak to us all,” says Dr Te Maire Tau, Upoko of Ngāi Tūāhuriri. 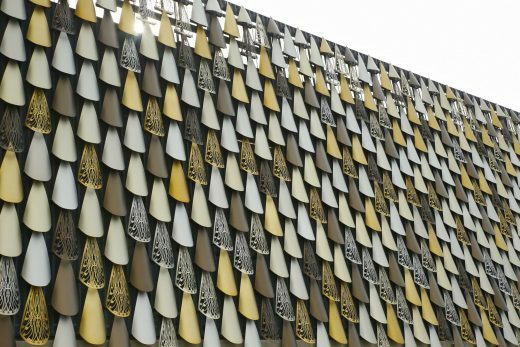 In the wake of the 2011 earthquake, mana whenua realised that one way to bring meaning to the destruction in central Christchurch was to get involved in the recovery process, and ensure that Ngāi Tūāhuriri identity was visible in the city. “Very early in the rebuild process Ngāi Tūāhuriri called on the values of their ancestors to guide the process,” Dr Tau says. “We selected the principle – Kia atawhai ki te iwi – Be kind to your people – the founding kaupapa, recounted by Pita Te Hori, first Ūpoko Rūnanga of Ngāi Tūāhuriri in 1861, to be at the centre of our contribution to the rebuild. Ngāi Tūāhuriri believes the anchor projects must demonstrate care for the citizens of the city and encourage warmth and a sense of welcome,” says Dr Tau. In 2014 Ngāi Tūāhuriri established the Matapopore Charitable Trust, which works in partnership with local and central government agencies to contribute to the 17 anchor projects that make up the Christchurch Central Recovery Plan 2012. The anchor projects include large-scale builds such as the Justice Precinct, the Convention Centre, and the Performing Arts Precinct, and Matapopore is tasked with ensuring that Ngāi Tūāhuriri history and values are represented in each of these projects. 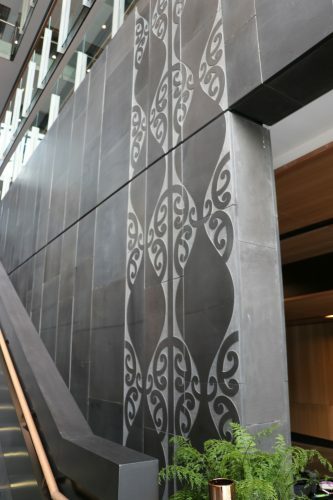 Renowned Ngāi Tahu artists Lonnie Hutchinson and Fayne Robinson were commissioned to bring a Ngāi Tahu aesthetic to Te Omeka, and to help to embed the tikanga of the iwi into the fabric of the building. Kahu Matarau, by Lonnie Hutchinson. One of the works that has been visible for many months is Kahu Matarau, designed by Lonnie. Situated on Tuam Street, the eight metre high, 36 metre long aluminium kākāpo feather cloak wraps around the precinct carpark as an expression of high status or mana. Below the cloak sits a garden that depicts a whāriki (woven mat) with a zigzag tāniko pattern emerging through clever use of native planting.Pikihuia I Te Ao, I Te Pō is another of Lonnie’s works visible on the exterior of Te Omeka – this design has been translated onto the Durham Street glazing and uses the prestigious feathers of the extinct native Huia bird as a reminder of consequences when we don’t act with care. The feathers are visible both day and night. Fayne’s Kōwhaiwhai design was sandblasted into stone at the entrance. Fayne’s works can be seen on the interior of Te Omeka. He has designed a sinuous kōwhaiwhai for the entrance portal, or ngūtu leading into the Māori Land Court, where mangōpare, pūhoro and taniko designs flow through timber and stone. A close inspection of the space will reveal Fayne’s influence, from the tactile indicators below the stairwells to the hand carved handles of the four entrance doorways in the Maori Land Court. These have been carved from native timber of the black Maire tree to represent both tuna (eel) and patu (weapon). Ngāti Waewae of the West Coast sourced Rimu (a rākau rangatira or chiefly tree) and Tahutahi Pounamu (Snowflake jade) for the prestigious entrance to the Māori Land Court. Reflecting on his contribution, Fayne is humble and understated. “As Ngāi Tahu artists, everything we do revolves around upholding the mana of the people,” he says. “Māori art is about symbolisation, and finding symbols that best reflect and represent Māori values and tikanga. I think we have done well in embedding these symbols into Te Omeka, but I also think we could have done more,” he says. Te Omeka is a stunning example of the expression of Ngāi Tūāhuriri values, traditions and concepts embedded in a contemporary urban environment.